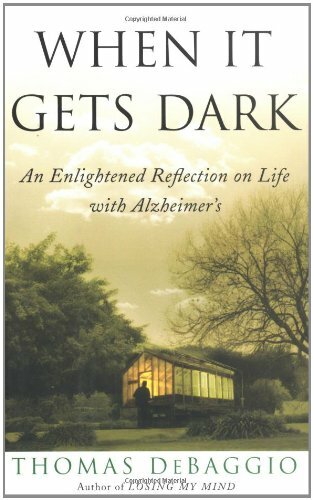 When It Gets Dark: An Enlightened Reflection on Life with Alzheimer's by Thomas DeBaggio is a poignant account of a man's efforts to retain a part of his memory in the face of Alzheimer's Dementia. Thomas DeBaggio was diagnosed with Alzheimer's, a progressive disorder which leads to loss of memory. The short term memory is affected first and then the longer term memory too. In this book, the author tries to recollect his past life, partly helped by his wife, son and a few other relatives and close friends. Since the author was a gardener all his adult life, he describes that part of his life in considerable detail. The actual symptoms or problems of Alzheimer's are given rather briefly, that too towards the end of the book. The book is interspersed with short paragraphs full of despair, self-pity etc., which is to be expected in a patient who has been given a slow but sure sentence of mental death, since loss of memory is a mental death. The narration is gripping and moving at places, especially on pages 179 and 180. It gives a fairly good portrayal of the anxieties, fears and despairs of a sufferer. However, if you are looking at a medical description of the disease, treatment options etc., you will need to look elsewhere.